I first learned about Blank White Dice when talking to Zev at Essen 2016. It was my first time talking to him since he moved over to WizKids, and he was pretty excited about the game. Due to a combination of my (lack of) luggage space and WizKids’ inventory at Essen, we agreed to get a copy sent to me during the Winter. It took awhile to make it to the table due to the large glut of Essen games, but over the holiday break this year, it got repeated plays. 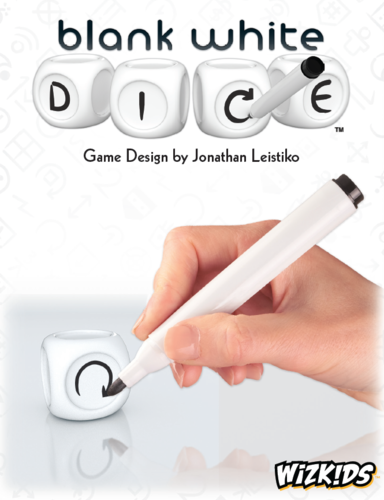 In the game, each player starts with two blank dice and an erasable marker. There are 5 core cards which are placed on the table. 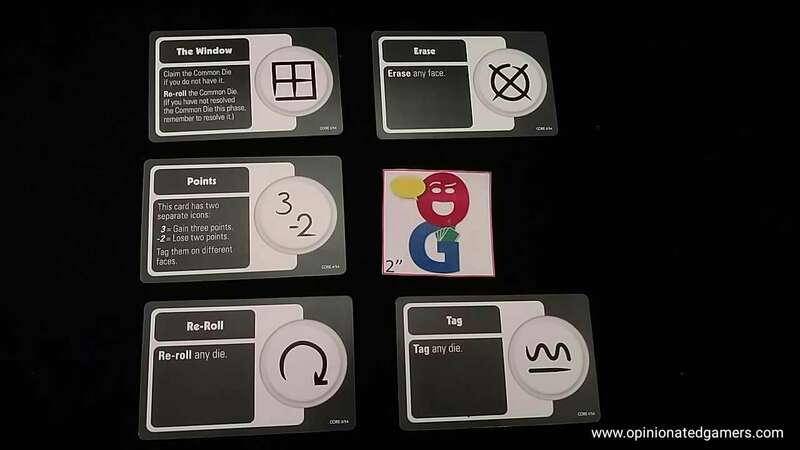 Then, for the intermediate game (which is what we play here primarily), each player is dealt 2 icon cards, and each player secretly and simultaneously chooses one to add to the tableau in the center of the table – thus, there are 9 icon cards in play. The unchosen icon cards are placed in a reserve pile nearby. Once the tableau is set, each player takes their two starting blank dice and “tags” them four times in total. When you “tag” a die, you draw the icon from one of the tableau cards on a blank side of a die. You may split your tags up as you wish between your two dice (4&0, 3&1, 2&2), and you may repeat any tags as many times as you like. Finally, there is a common die – easily distinguished as it is larger than the regular dice. Starting with the starting player, each player tags the common die once. The common die is then put on its core card to start the game. The game is then played in a number of rounds – until at least one player has reached the target number of points. In each round, there are up to five phases. First Phase – if there are icons in the game with a “First” effect, and those icons are visible – they happen now. Main Phase – In the main phase, in turn order, players resolved all of their rolled dice. You may choose the order in which to resolve your dice. As a general rule, any blank face is resolved by tagging that blank face with an icon. Otherwise, you perform the action of the icon showing on the rolled die. It is definitely possible that you roll a blank face, use the action from a different die to tag that blank face, and then perform that newly drawn icon when you resolve that die. Conversely, if a die loses its icon before it is resolved, the newly blank face would be tagged as its action for the turn. As a final note, if you have an icon which does not affect the game at all (which could happen if the card corresponding to it is no longer in the tableau), that icon resolves by erasing itself. Some examples of the possible icon actions are further below. Last Phase – if there are icons in the game with a “Last” effect, and those icons are visible – they happen now. Check for a winner – Look at the scoreboard. If there is a player who has at least 13 points AND is in sole possession of the lead, he is the winner. Otherwise, play another round – the starting player rotates around the board to start the next round. Re-Roll: Force any die in play to be re-rolled. If it is one of your dice, and that die has already been resolved, it does not resolve again. The Window: Roll the common die, if you do not currently control the common die, take control of it now keeping the newly rolled active face. 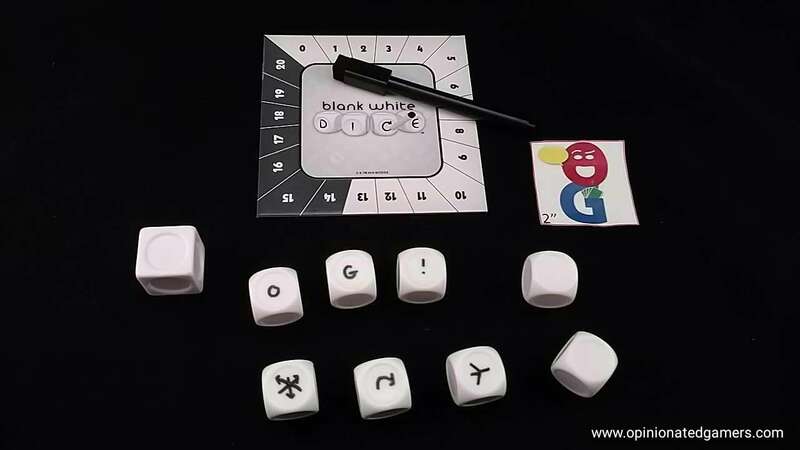 Blank White Dice gives you a lot of game in a small package here. The player has a fair amount of choice and decision choosing how to tag or erase the die faces in the game. Each game is very different based on the action cards in play. While the core cards are always there to start the game, the other cards chosen by the players can clearly open up different strategies in each game. Furthermore, as some of the cards allow you to “overwrite” (or replace) cards in the tableau – you might even have to change your strategy on the fly. The turn format itself is pretty simple. You generally have two or three dice in front of you, and you can use each one once. Trying to get the common die seems to be an important play as it can increase the number of actions you take by 50%. Of course, you need to remember that it almost always costs you an action to obtain the common die, so it’s helpful to be able to hold on to it once you have it. You should also pay close attention to the tags on the common die – it may become so filled with negative icons that you may not want to have it at all! 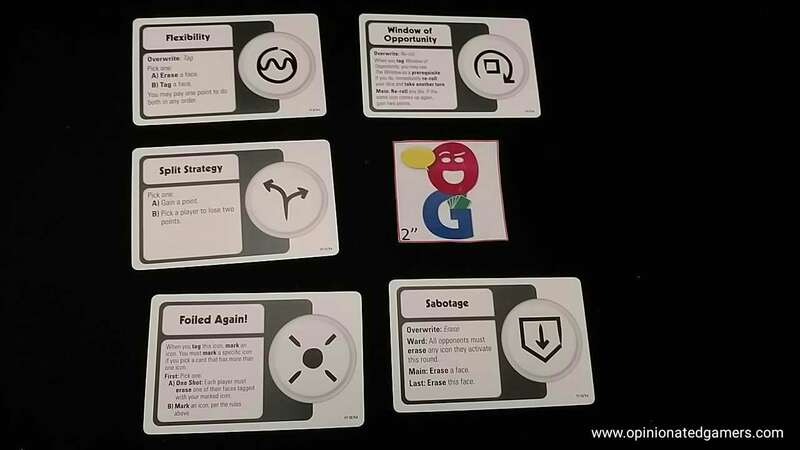 Each turn tends to move along quickly – thus far, we’ve actually found that the longest actions are the tagging and erasing actions as players usually have to look at all the possible icons or consider all the possible die faces before taking a turn. Otherwise, it’s pretty simple to look at your two or three actions, figure out which order to do them in and then execute those actions. There are obviously a number of different strategies, but they’re all dependent on which cards are in play at the time. What I like about the game is that all players have the same rules/conditions to deal with, so no one has an inherent advantage. Everyone has access to the same possible icons, and the player who is able to best plan (as well as roll best) will come out victorious. After our initial plays, there are definitely a few cards which are complex. At the start of the game, as well as any time a new card enters the tableau, I would recommend taking a minute to have the table talk out any possible rules questions of the new card so that all of the functions are understood. The small format box is nice and the components fit inside with a minimum of air. The markers have worked well so far and have not seemed to dry out too rapidly like some of the other erasable markers included in games in the past.